We don't expect budget PCs to look anything special. CyberPower proved us wrong, though, giving its Infinity 600 an eye-catching case complete with an expensive-looking side window. Better still, it doesn't look as though getting this classy chassis has resulted in features being cut elsewhere. 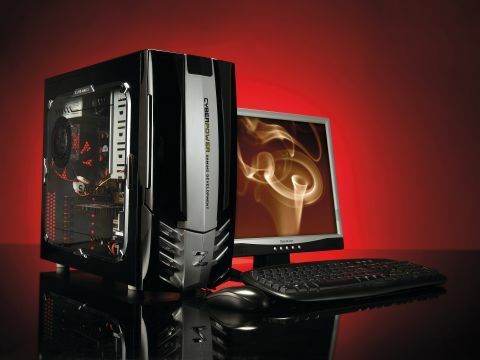 The Core 2 Duo E6300 CPU outperforms the Pentium D offerings from many of its rivals. That's matched with 1GB of DDR2 800 MHz RAM. The company also throws in an 18x speed DVD writer, together with a quality Logitech keyboard and mouse. The inclusion of a 256MB GeForce 7600 GS even means you can play games like Far Cry at an acceptable frame rate, more than you have any right to expect from a £500 system. Let's find out if compromises have been made. Quality components made the Infinity 600 a fast system, but corners had to be cut to give the PC this performance edge. One of them was the inclusion of Vista Home Basic, rather than the Premium version, so you'll have to do without features such as the Aero visual effects. Another relative weak spot is the 17-inch monitor. It's acceptable, but still manages only average image quality and can't compete with the 19-inch models on offer from many of its rivals. The other area of concern is the hard drive, which is a little short of space at only 200GB. It'll be adequate as long as you're careful (or not a big downloader), but is less than we'd have liked for a Vista system. No £500 PC is ever going to be perfect, though, and the Infinity 600 does more for the money than most. If you want to play games or value speed above all else then this could be the PC you need.